If you’d like a simple and highly accurate way to calculate your variations and raise applications for payment, then look no further. Ensign’s Ductwork Quantity Surveying Software integrates easily with our Ductwork Estimating Software, pulling through schedules of rates and job and section values for you, to save you time and help you produce the kind of detailed applications for payment that leave your clients in no doubt how much effort you’ve put in on their projects. 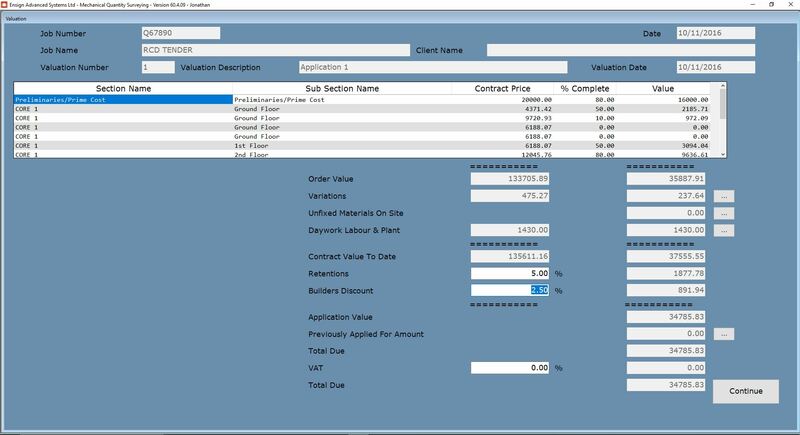 Our QS software will easily raise payment applications for you, taking all of your variations into account and calculating plant hire, adds and omits, pro rata calculations, star rate times, day-work and more, to give you a highly accurate application for payment, which lists everything out for you and your clients in detail, giving you a much greater chance of getting paid exactly what you are owed on time. Used with Ensign’s Ductwork PDF Take-Off Software, you can measure variations on your PDF drawings, which can then be imported into the Ductwork QS system giving you immediate and precise variation calculations, and you can even use your PDF drawings as extra proof of your variations. Ensign has over 35 years’ experience in this field and we’ll take the time to get to know your business and set up your QS software as you need it. We also offer step-by-step bespoke training to ensure you get the most from our software, and our friendly and helpful, widely experienced team will give you all of the support you could need. Want to make your jobs pay on time? Then give us a call and let’s get your business moving.